... a motion picture for all times! Poor Henry the Eighth - he had a rough time in the Sixties. First Herman's Hermits released that atrocious song, "I'm Henry VIII, I Am". Technically, it wasn't about the monarch - it played on his name by association with some dork who was the eighth guy named Henry (or "Enery", as Peter Noone called him) to marry the same woman. 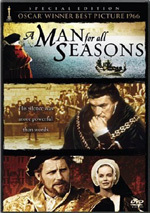 If that blight on popular music weren't enough, we also find 1966's A Man For All Seasons, a film that involved Henry's realm. Unlike the song, the king himself plays an important role in the picture. However, the story mainly examines the conscience of Sir Thomas More, a one-time chancellor of England who falls far and fast due to his refusal to neglect his beliefs to serve political means. This is the kind of tale that could make for an epic saga, but Seasons is not the film to offer a grand, dramatic telling. In fact, this movie seems almost unbelievably dull considering the subject matter. How could such high drama become so bland and listless? Robert Bolt adapted Seasons from his own play. Therein lies some of the answer to my question. By necessity, stagework tends to be much more driven by dialogue and less visceral than are films, for obvious reasons. Different scenarios and settings can be displayed much more realistic and literally in a movie, whereas plays need to suggest these things in more subtle ways. This means lots of talk, as dialogue is the most logical way to advance the story on a stage. And that's why so many screen adaptations of plays seem so dull. Not enough liberty is taken with the original material to truly modify it for film. Such is the case with Seasons; the subject matter becomes rendered impotent by the dry treatment. Although the movie does go outdoors, most of the "action" limits itself to some interior sets, and almost nothing happens that isn't spoken. Most things are told to us, not shown. Some may accuse my bias against dialogue-laden films as being anti-intellectual or whatnot, but I disagree. I'm not saying that every movie has to be as visual as Armageddon or some other project that could never exist on a stage. I just don't see the point of adapting films from plays if the advantages of the medium will not be used. Seasons definitely does not do anything that makes it interesting as a film, and the whole piece appears flat and drab. This is the kind of movie that makes people avoid historical dramas. Plenty of pictures have dealt with similar subjects well and have made them visually compelling; Elizabeth provided an excellent example of that category. None of that movie's flair or drama appear in Seasons, however, as it seems so bound to the printed page that any possible life is driven out of it. As with another play adapted into a movie – Driving Miss Daisy - I can't find any real faults with the technical aspects of the film other than its inherent stiffness. Otherwise, the piece is well-crafted. The plot moves slowly but keeps on an acceptable pace, and most of the performances are adequate. I don't think Paul Scofield deserved an Oscar for his portrayal of More, but he provides decent work in the role and certainly isn't the reason for the movie's problems. Ironically, the only "large" performance in Seasons is actually its worst. Robert Shaw plays Henry VIII and does so in an absurdly bold manner. I generally like Shaw's work. He provided terrific acting in Jaws and Force 10 From Navarone, but he simply tries too hard here. He makes Henry a silly caricature and a buffoon. He provides a laugh or two but renders the character too goofy for us to take seriously, something that negatively affects the story. I can't say I really disliked A Man For All Seasons, if just because it taught me a little about a subject that remains largely unknown to me. However, it proceeds in such a bland and stiff manner that I could muster no affection or excitement for it. It stands as a perfect representation of the dull, serious dramas that have often won Best Picture Academy Awards, and that's not meant as a compliment. 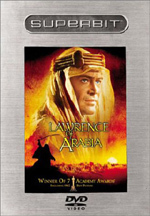 A Man for All Season appears in an aspect ratio of approximately 1.66:1 on this single-sided, double-layered DVD; the image has been enhanced for 16X9 televisions. The transfer seemed better than adequate but less than stellar. Some mild to moderate edge enhancement created a few problems related to sharpness. At times the movie boasted terrific delineation and could look great. However, more frequent were the instances when it seemed a bit soft and ill-defined. The flick never appeared particularly weak, but I thought it seemed just a little “off” during more than a few shots. I noticed no issues with jagged edges or shimmering, and source flaws remained minor. Occasional specks and marks cropped up but these didn’t create many distractions. The flick could be a bit grainy, though. Colors tended to look somewhat bland. Some of this resulted from production design; after all, Seasons wasn’t a film with a subject or setting that demanded vivid hues. Even when I considered that, though, I thought the tones tended to be a bit lackluster. They weren’t weak, but they weren’t memorable either. Blacks were fine, as they seemed appropriately dense, and shadows looked reasonably clear. A few shots appeared slightly dark, but those were exceptions to the rule. This was a serviceable transfer but one with too many issues to merit anything above a “B-“. For this DVD, Seasons received a Dolby Digital 5.1 remix. This took the movie’s original monaural audio – which also appears on the DVD – and opened it up a little. Why in the world anyone thought a film as low-key and chatty as Seasons needed a 5.1 track escapes me, but it’s here if you want it. Don’t expect the mix to broaden its horizons by much, though. For the most part, the audio remained stuck in the center channel. Music didn’t appear too frequently but it showed mild spread to the sides. Speech usually stayed in the middle, though some lines popped up in the side when appropriate. Effects also came from the sides and rears on a few occasions. Again, these were very reserved, as the movie included no scenes that required much from channels other than the center. This was a pretty superfluous 5.1 remix, as we heard little other than dialogue. Speech seemed clear and intelligible. I thought the lines were a bit stiff, as they stayed distinctive but lacked natural qualities. Still, they were perfectly acceptable. Music appeared infrequently and came across as somewhat thick. The score lacked much range and failed to deliver much of an impact. Effects were very mellow, and they sounded clear and acceptably realistic. I felt Seasons deserved a fairly average “C+”. How did the picture and sound of this Seasons DVD compare with the original 1999 release? Although the old disc claimed to be 1.85:1 and this one was 1.66:1, I found it very hard to determine differences between the two images. Perhaps the 1999 release was 1.66:1 as well and mislabeled. Whatever the case, I thought the pair looked an awful lot alike; I found it difficult to differentiate between the two. As for the audio, changes were more noticeable since the 2007 DVD included 5.1 sound while the 1999 version stayed with mono material. However, since the Dolby Digital track stayed so reserved and stuck in the center, the 5.1 spectrum didn’t add anything to the experience. As for the quality, speech improved a little for the 2007 disc; the lines were a little cleaner. On the other hand, I thought music lacked the mild breadth of the original track, as the score was somewhat dense. Since Seasons focused so heavily on dialogue, the 5.1 track was a slight improvement, but it’s not a big one. Though the 2007 Seasons comes billed as a “Special Edition”, don’t expect many extras. We find a featurette called The Life of St. Thomas More. In this 18-minute and 16-second piece, we get movie clips, archival materials, and interviews. We hear from authors Alison Weir and Dr. John Guy as well as Center for Thomas More Studies founding director Dr. Gerard B. Wegemer. The show goes through More’s early life and education as well as his ideas and writings. We also learn a little about King Henry VIII and More’s relationship and interactions with him. These subjects lead us through the issues confronted in Seasons and help flesh them out for us. “Life” is a short but reasonably informative look at More. The DVD opens with ads for Sense and Sensibility and Little Women. These also show up in the trailers area. No promo for Seasons appears even though one popped up for the old release of the film. Unfortunately, it's only the status of A Man For All Seasons accorded it as a Best Picture winner that makes me regret its paucity of goodies, as the movie itself is a long-winded bore. 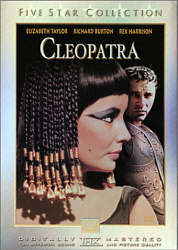 This is the kind of film that gives historical pictures a bad name. 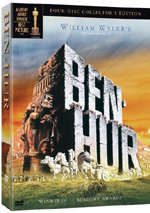 The DVD itself provides decent picture and sound in addition to the minor extras. A Man For All Seasons warrants a look only by completists who want to see all the Oscar winning films from over the years; everyone else should give this yawner a pass. For those fans who already own the original 1999 DVD of Seasons, should they pick up this new version? I don’t think so. I felt that both discs offered virtually identical picture quality, and any audio improvements were quite minor. The insubstantial set of supplements meant that this DVD’s status as a “Special Edition” was a joke; one short featurette and a couple of ads makes this a “Special Edition”? Skip this weak re-release.